Here in Florida things are literally heating up as Storm Season has arrived. We are approaching the height of our hurricane season, traditionally that’s around Labor Day at the beginning of September. Our temperatures have been in the mid-90’s (~ 35°C) for most of the summer, “the hottest July in history”. On Monday Tropical Storm Emily “blossomed” in the Gulf of Mexico, “With only 8 hours from formation to landfall, Emily is one of the quickest hitting US landfalls in past 30+ years“, tweeted scientist Michael Lowry. TS Emily quickly gained landfall soaking much of the state with sorely-needed rain and threatening our area with tornadoes which thankfully did not materialize. Needless to say, the Weather Channel and weather reports in general become much more of a priority to keep an eye on over the next couple of months. Today’s swirly tangle could represent this weather theme … Bysomnus is from South African CZT Milde Weiss and it’s her third tangle on the site. Somnus was the God of Sleep in the ancient Roman mythology. This tangle came to me while I was lying awake at night. Somnus left me after a brief visit, so it was a case of “Bye, Somnus”! I thought that I might fall asleep and quieten my busy brain if I could focus on something simple, like a repetitive circular movement… Ha, ha, ha! That circular movement became my new tangle! It starts off like Well, with the first set of lines starting at the middle dot and ending in the corners. The second set of lines also start in the middle, and end halfway between the corners. The third set of lines start at the outer edges and curve inward, meeting the adjacent lines about two thirds from the middle. The 3 filler lines on each ‘petal’ starts with a middle line from the middle, ending halfway on the outer line, and the two lines flanking it also halving the available space. Over the years I’ve had many tangle submissions that are very similar in construction to Whirly Bird, some with rounded “petals” to make a floral-looking end result. Others are a simple variation of the Zentangle-original Squid tangle. Milde’s Bysomnus stands out because she takes it a step further in construction for more visual interest. Bysomnus can either be based on a grid as in my example using it as a fragment in a reticula (translation = seed in a grid) or as Milde demonstrates, a free-form tangle with flowing connecting aura strokes. 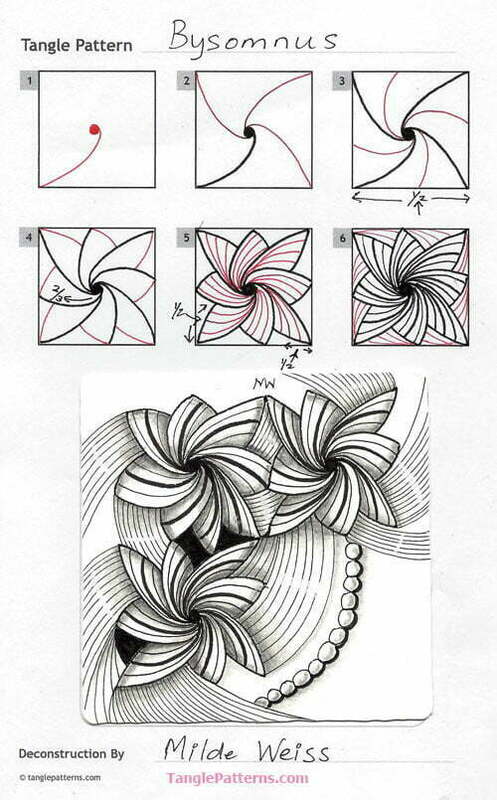 Milde illustrates the step-by-step instructions for drawing Bysomnus below and she demonstrates it in two beautiful Zentangle® tiles. A delicate touch of shading makes a big difference in this tangle. 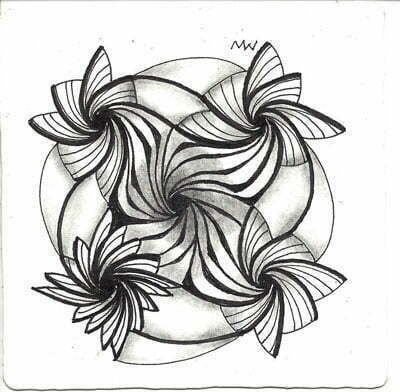 Milde’s second Zentangle tile, a Bysomnus monotangle. Check out the tag milde_w for more of Milde’s tangles on TanglePatterns.com. Love this new tangle! I’ve been slacking, but this really inspires me to get back to work. Thank you for sharing it with us. I will be trying ‘bysomnus’ very soon. I like the patterns that sart in a center and lines go outward. This will be a good one for me! Thank you. This looks like a keeper! Love that swirly look…..Thanks so much for sharing! I do a lot of garden themed pieces so this fits right in. I liked doing ‘vortex’ so I know I will like doing your new ‘bysomnus’ and thank you for bringing it to us. This looks like a fun one with lots of opportunity for different fills! Your stepout is clear and your examples are wonderful. Thank you! I found the fractions noted in your step-outs very helpful. This design looks complex but with your instructions I found it easy to accomplish! Very nice. I know I will use this one a lot! This one will be fun. Thanks for sharing. This is a great Tangle! I see lots of possibilities for this one. Thanks for sharing it with us. It looks like candy cane twisted into beautiful flower. Its beautiful. I am definitely going to try this. Thank you. Thank you all for your kind comments. It is very rewarding to know that Bysomnus gives you joy! What a beautiful, fun, satisfying Tangle! It is a pleasure to look at, and hugely relaxing to play with! Thank you! I love what you’ve done. I have only just discovered Zentangle this summer, and Bysomnus this late afternoon while perusing this site for the first time. I can’t seem to get enough of this Tangle! Thank you, Melissa. Good to know that others also enjoy it.